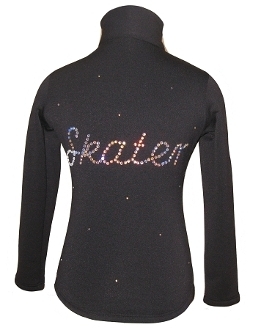 Ice Fire Fleece Figure Skating Jacket - Skater. Polartec power stretch ice skating jacket with crystal applique: apx.100pcs. superior machine cut czechoslovakian rhinestone size 20ss AB crystal. Great for every day practice and competitions. Fitted style without a hood and the high performance polartec fabric is ideal for ice skating which demands freedom of movement, moisture management, and warmth. Choose from several colors in Child XS - Adult L.
IceFire can take 4-7 business days for delivery.